The week is almost over yet we still have a lot going on ....2 counter games for me on Friday and Saturday......Logan's baseball game.....a birthday party ...my hair appt (yay! :)) ...Booster Club Clay Shoot.....and Logan gets to go with the Fuente's to TCU football practice. Phew....that's a busy next couple of days. Now I'm really sad that I don't have my camera...ugh!! I hope everyone is having a great week. It is finally October and Christmas will be here before we know it....crazy huh. Enjoy the cooler temps and have a great weekend!! Sounds like you guys are all keeping very busy on your end. Hope you have a great weekend, and again CONGRATS to Miss Trinity! 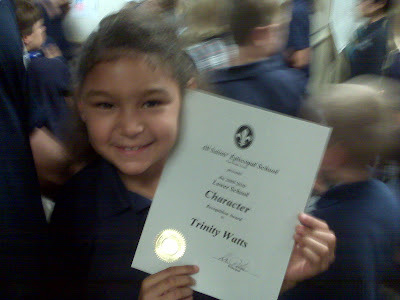 That's awesome Trinity! You are such an amazing child with such a big heart! I am so very proud of you sweetie! i love you very much!!! Hugs & Kisses from Auntie Liz!